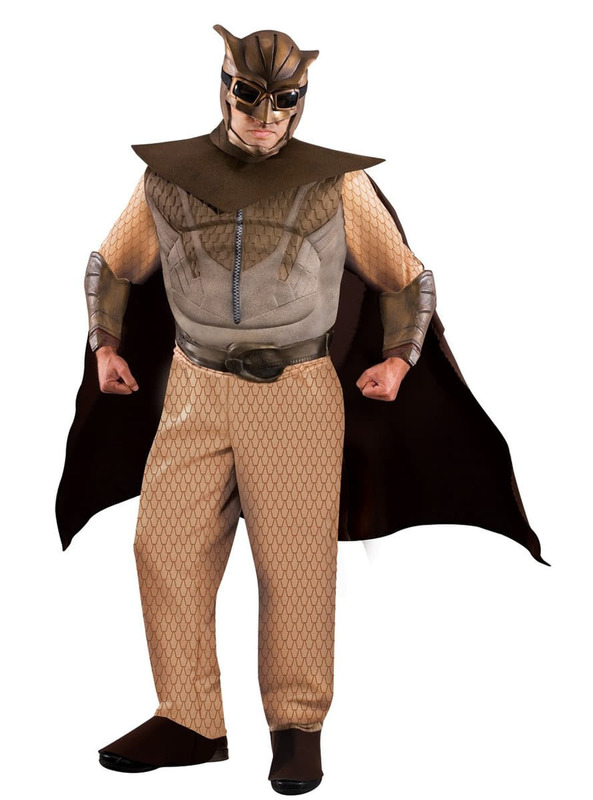 If the weight of the law does not stay with those who deserve it, fight for justice with this Night owl Watchmen costume for a man large size. Night owl is a masked crime fighter, in the first version his character was called Hollis Mason and was a police tired of crime who ended up joining the Minutemen. When he retired, he passed the baton to Dan Dreiberg, who became Night owl II. The limited comic book series was created as a means to reflect contemporary anxieties and criticize the concept of the superhero by presenting an alternative to them. They arose in the 40s and 60s years helping the United States win the war in Vietnam. There was also a 2009 movie directed by Zack Snyder, where the story takes place in 1985 and the protagonists, the Watchmen are the successors of the Minutemen. This striking night owl costume includes a jumpsuit in brown tones with accents that look like the feathers of an owl, ending in a dark boot covers. The jumpsuit also has a muscular chest to create a more stocky appearance. Also includes the characteristic superhero helmet that looks like this bird's head and a brown cape with a matching belt. Upload your photos to Instagram with the hashtag #funidelia followed by #funidelia05268.